JACKSON, Miss. - Aug. 4, 2009 - Peterbilt Truck Centers, with locations in Mississippi, Arkansas, Louisiana and Alabama, has added StrandVision Digital Signage to its business marketing mix here, with plans to install it at all seven locations. Positioned in the service lounge and at the parts counter, the digital signs are regular flat screen televisions that show a number of promotional and informational pages. 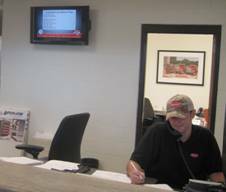 Peterbilt Truck Centers uses the signage to promote specials, including seasonal specials such as sun visors or air-conditioning service. It also advertises new and used trucks, the body shop, service and parts, and reminds viewers of its seven locations. Constantly updated national and local news, as well as weather reports with Doppler radar, are also shown. The StrandVision Digital Signage software complements Peterbilt Truck Centers' other Web, email and print marketing. Explained Peterbilt Truck Centers General Manager David Henderson, "We have customers who bring in trucks and may spend a few hours in our service lounge, while others are at our parts counter. The StrandVision Digital Signage presents a perfect opportunity to let them know about what we have and, perhaps, sell them something. I don't have any question that we've sold some product from it and that it has even more potential." The setup includes a personal computer that is attached to the regular computer network. The StrandVision Digital Signage information is delivered to the PC over the Internet and through the local network. The computer drives two flat screen televisions - one in the service lounge and one at the parts counter - using StrandVision's innovative PC-2-TV.net high-definition personal computer-to-television adapters. The Parts Manager regularly updates the digital signage pages on all of the displays simply by visiting StrandVision's administrator's console over the Internet. In summing up his reasons for selecting StrandVision, Henderson said, "It was a combination of things. StrandVision was very helpful and easy to work with, the price was reasonable, the product was easy to use and we didn't have to put in too much equipment." StrandVision LLC delivers low-cost, Web-based Software as a Service (SaaS) digital signage through a patent-pending approach that delivers content to subscribers' LCD and plasma displays, as well as computer screens and Web sites. StrandVision's Digital Signage software distributes text and graphics pages, including advertisements, video content, and national and local weather and news. It is ideal for medical and dental offices (patient education), banks, retailers and industrial distributors (video merchandising), employee break rooms (events and benefits), non-profit and religious organizations (member and supporter communications), and other organizations.